Now accepting reservations for Building 11 delivery Summer 2019! Master bedroom on the first floor options available! Situated on 13.5 acres of land at 70 Endicott Street, within walking distance to Big Y Shopping Center and only two miles south of Norwood Town Hall. 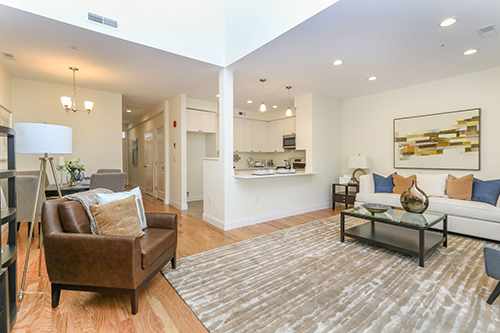 A total of 112 beautifully designed, maintenance-free, spacious two-level townhomes. Each standard townhome has two bedrooms, one and a half baths and a single car garage, along with a tandem driveway parking space. Homeowners may choose from distinctive floor plans, including units with a first floor master bedroom. The tax rate in Norwood is the lowest in a 25-town radius. Additionally, the municipal electric company provides electric rates that are currently about one-half of competitor’s prices. The town also offers weekly curbside trash pickup, cable and Internet service, and an outstanding public school system.